Content note for abuse and murder of autistic people. I live-tweeted my reading of John Donvan's and Caren Zucker's "The Story of Autism" book In A Different Key when it was first published in early 2016. As the Storify platform my live-tweet compilation was originally published at has since gone under, I am republishing it here. Verdict: Though well-intended and containing some interesting points, In a Different Key lacks empathy for autistic people themselves—even justifying parents murdering their autistic children. It also contains sloppy factual errors. Details in tweets/RTs below. 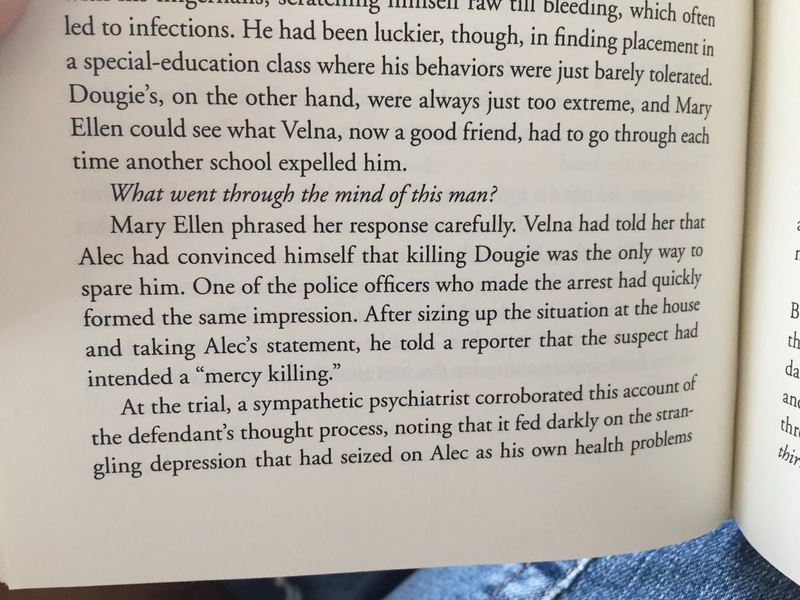 Note that in the interim, additional information has emerged about the details of Hans Asperger's work with the Nazi regime, and also also the regarding how researcher Herman Czech specifically kept this information away from NeuroTribes author Steve Silberman despite repeated requests, yet shared it with Donvan and Zucker during the two books' parallel writing period. For details, see Silberman's "conversation across neurologies" with Max Sparrow, on "how competition for priority can distort the process of excavating history." Live-tweeting my read of new book #InADifferentKey, from my perspective as a parent of a 1:1 #autistic teen, and a #neurodiversity supporter. Again with #InADifferentKey terminology. “Head bangers” are 80s/90s rockers. Otherwise, head banging is what a person does, not an identity. 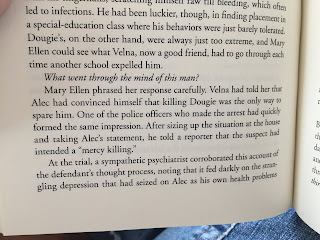 Many horrors against #autistic people included #InADifferentKey; worst so far: authors implying Dougie Gibson’s murder was a “mercy killing"
Dougie Gibson’s father convicted of murder, accd’ing to #InADifferentKey, only b/c jury didn’t get how hard “severe” #autism is—on parents. Other #autism parents recognized the despair of Dougie Gibson’s father, argues #InADifferentKey, in defense of murdering #autistic children. While #InADifferentKey constantly describes #autism as extreme hardship for parents, it pays little attention to #autistic kids themselves. Seems like #InADifferentKey could at least consider the misery of an #autistic child who is constantly being misunderstood and unaccommodated. #InADifferentKey is frustrating: The history of how #autistic kids became visible and educated matters. But so does honoring their humanity. #InADifferentKey is frank about Lovaas’s abuses of #autistic children, but doesn’t exactly condemn them, either, not when they “worked." Again #InADifferentKey dehumanizes: Lorna Wing unique among researchers in going "home to #autism at night,” rather than home to her child. Why is #InADifferentKey so sympathetic to Lorna Wing’s efforts to expand the #autism spectrum, yet so often hostile to those she included? #InADifferentKey’s bias against Hans Asperger, in featuring only mostly his negative statements re: the boys he treated, is iffy journalism. Wish #InADifferentKey would stop with “families dealing with" #autism or DD, say “families who try to support their #autistic kids” instead. Irresponsible: #InADifferentKey focuses on desperation of parents to communicate w/#autistic kids when result is tragedy, ignores valid AAC. Many #autistic people can’t speak/react typically due to motor/processing difficulties. #InADifferentKey has yet to consider that (p. 371). #InADifferentKey’s authors must now buy the entire internet a drink, due to invoking cancer analogies in discussing #autistic heterogeneity. Apologies that it's taking me so long to live-tweet reading #InADifferentKey: 1) Life interrupts & 2) It’s painful to read, on many levels. Kids like Dov Shestack are both chronically ill *and* #autistic. Co-occurring. Illness is not, as #InADifferentKey suggests, part of #autism. #InADifferentKey readers: #autistic people do indeed have higher rates of co-occuring medical conditions. But #autism is *not* medical. Yes, $$ can influence direction of #autism research, as #InADifferentKey notes. Hence need for skepticism, reliance on unbiased expertise. Pseudo- or misguided #autism science (ECT for “behaviors," epigenetic causation) look plausible to lay folk yet horrify ethical researchers. Dehumanizing phrases to avoid, yet used in #InADifferentKey: “Living with #autism” when discussing parent rather than #autistic experiences. Interesting to read about IMFAR/Int’l Meeting For #Autism Research roots as a joint CAN/NAAR curebie/biomed initiative, in #InADifferentKey. If only books like #InADifferentKey could focus on *why* an #autistic person might smear poop, instead of framing as horrorshow for parents. @SherriPizza Different when people talk privately. Book broadcasts an #autistic kid’s misunderstood struggles as horror for parents only. @SherriPizza It’s not that parents aren’t allowed to have feelings. It’s that #InADifferentKey is ~exclusively about parent perspectives. @SherriPizza And yes, it can be desperately lonely as a parents. But books like #InADifferentKey make it worse, IMHO, by compounding stigma. Good to see #InADifferentKey acknowledge (tho 3/4 thru): #autistic insights are lifelines for parents who struggle to understand their kids. #InADifferentKey, like #NeuroTribes before it, has good info on backstory of Rain Man. It’s not for #InADifferentKey’s non-#autistic authors to declare Dustin Hoffman’s #autism portrayal “flawless.” Ask #ActuallyAutistic folk. Before Temple Grandin/late ‘80s, #actuallyautistic insights weren’t available to parents/public. #InADifferentKey Thankfully no longer true. #Autism professionals have important roles, but there is no substitute for #actuallyautistic insights, in understanding #autistic people. #InADifferentKey finally cites #autism understanding/compassion; but only as way to help Temple Grandin normalize, & not her #autistic QoL. Like #NeuroTribes, #InADifferentKey shows there is no #autism “epidemic,” only changes in diagnostic criteria, and diagnostic substitution. OK, so #InADifferentKey mentions later that @Salon retracted RFK Jr’s Deadly Immunity article on thimerosal. Several chapters later. @NeuroDiverseAU I’m disappointed, honestly. I already knew #InADifferentKey was anti-neurodiversity, but I didn’t expect sloppy reporting. #InADifferentKey cites @DrPaulOffit profiting from invention of rotavirus vaccine, ignores years of labor to create it, with no $ guarantee. Sloppy: #InADifferentKey cites anti-vax furor over @DrPaulOffit profiting from rotavirus vaccine; ignores 100Ks of lives vaccine has saved. I understand #InADifferentKey is trying to tell a compelling story. But the story is strangely sympathetic to pseudoscience #autism beliefs. Glad to see #InADifferentKey recognize @deerbrian’s crucial role & then-rare skepticism re: Andrew Wakefield, in taking that charlatan down. #InADifferentKey is correct: Wakefield’s conflicts of interest in trying to undermine public confidence in the MMR vaccine are *stupefying*. More #InADifferentKey sloppiness: it’s the *oral* polio vaccine that very rarely causes polio—and it hasn’t been used in the US since 2000. So it is irresponsible for #InADifferentKey to state that the polio vaccine sometimes causes polio, when the US's injected version does not. Michelle Cedillo’s story *is* a tragic one. But yet again, #InADifferentKey evokes “misery" of #autism by describing “behaviors” not people. Schools still force #autistic kids to listen to non-autistic kids complain about them as @alexplank did in #InADifferentKey. Needs to stop. While #InADifferentKey notes “Aspies” like @alexplank work hard to “pass,” its authors work just as hard to dismiss #autistic commonalities. Why is it #InADifferentKey authors cannot conceive that #autistic people of all abilities may have more in common than not? Bias or denial? #InADifferentKey could ask: Why aren’t *all* kids taught a common social skills framework? Why the pressure on #autistic kids, zero on non-? Major #InADifferentKey fail: In claiming #autistic self-advocates are parents’s adversaries, it shows ignorance of what neurodiversity *is*. No, #InADiffferentKey: The “Ransom Notes” campaign failed b/c it dehumanized #autistic ppl, not b/c ran “afoul" of neurodiversity movement. Acc’ding to #InADifferentKey, non-parents like Jim Sinclair shouldn't speak for #autistic kids “disabled in the extreme.” Like my own son? At least #InADifferentKey’s agenda is clear: Anyone who is mean to parents of #autistic kids is awful. Even #autistic people wanting rights. #InADIfferentKey in a nutshell — Cattle prods, murder, dehumanization: Let's not rush to judgment! Hurt a parent's feels: YOU MONSTER! What #InADifferentKey doesn’t get: High support 1:1 #autistic kids like my own son *need* self-advocates to fight for their rights/humanity. …b/c if people buy into messages #InADifferentKey spreads, ppl are *less* likely to support my #autistic son’s rights & humanity, not more. #InADifferentKEy dismissively describes #autistic #autism researcher/info nexus Michelle Dawson @autismcrisis as a “formal postal worker." #InADifferentKey critiques & patronizes @aneeman for a “failure of empathy”: telling parents to seek humanity, not cures for #autistic kids. Since @aneeman is proudly #autistic yet refuses to be a self-narrating zoo exhibit, #InADifferentKey decides he cannot empathize w/parents. Pls also note, #InADifferentKey: I would take issue w/your "not #autistic enough/no empathy” character assassination of @aneeman regardless. #InADifferentKey claims people avoided arguing w/ @aneeman publicly for fear of being seen as bigots. Or maybe b/c his arguments were sound? @thinkingautism @aneeman For fear of being seen *accurately* as bigots. "I'm not ableist, but..."
#InADifferentKey's patronizing continues: “@autismspeaks gave [@aneeman] a pass to say what he wanted.” Like men “let” women have the vote? #InADifferentKey is so worried about “high functioning” #autistic @aneeman representing #autism that it ignores his cross-disability agenda. If #InADifferentKey actually paid attention to @autselfadvocacy work, it'd know @aneeman + team fight for #autistic people of ALL abilities. #InADifferentKey assumes @aneeman knows nada of high support #autistic kids, yet is “mind blind” if doesn’t cow to IRL attack by curbie mom. Asperger’s syndrome is not a “ticket onto the spectrum,” #InADifferentKey —Asperger himself recognized #autistic kids of all abilities. Kanner’s defining the #autism label excluded Asperger-like folk who needed support, for decades: the tragedy #InADifferentKey ignores. Correction: On p. 531, #InADifferentKey does mention @aneeman and Steven Kapp’s contributions to informing the #autism criteria in the DSM-5. #InADifferentKey claims parental love is one element in the whole #autism “saga” that is “unquestionably pure.” Really? Ask Issy Stapleton. Apparently #InADifferentKey authors have never heard of child abuse. Even as they document it. Here’s hoping the story of Donald Triplett helps #InADifferentKey readers accept non-standard, #autistic developmental paths & milestones. Correction, #InADifferentKey: iPad 2010 introduction made AAC more affordable & *accessible* to #autistic ppl w/communication support needs. The “Talking Typewriter” ERELS system was used to help #autistic kids communicate as early as 1965, for instance. Per #NeuroTribes. Finished #InADifferentKey. Verdict: This is not the #autism book you’re looking for. Not if you want to understand/support #autistic people.